Zlappy.com is a browser hijacker that is capable of changing your browser’s settings without your explicit consent. You most likely do not remember installing this hijacker onto your computer and that is because it entered your computer via software bundles. It was attached to free software and that allowed it to install alongside the software without you noticing. It is not malicious, despite what many users might think. However, it will change your browser’s settings and set itself as your homepage. Browser hijackers do that because they are designed to generate pay-per-click revenue for sponsored web pages and they use you to achieve that. If you are not careful or not delete Zlappy.com as soon as possible, you might end up with malware on your computer. You could be redirected to a malicious site or end up giving out your personal details to questionable people. We strongly suggest you take the time to remove Zlappy.com from your computer. If you install free software, you need to make sure that there is nothing attached to it. If there is, you need to deselect it. When installing software, always use Advanced (Custom) settings as you will be able to deselect everything that has been added and can then safely proceed to install the software. If you do not deselect the added items, they will install automatically. You should not choose Default settings as you will not be able to deselect anything there and will essentially be giving the added items the permission to install. If you want to avoid having to remove Zlappy.com or similar, always choose Advanced settings and deselect what has been added. 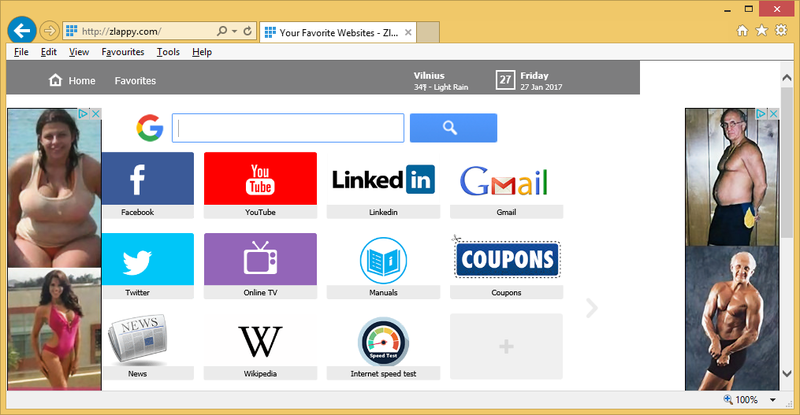 Just like any browser hijacker, Zlappy.com will change your homepage and new tabs. It will be able to hijack all your major browsers, including Internet Explorer, Google Chrome and Mozilla Firefox. The changes cannot be undone unless you delete Zlappy.com hijacker from your computer. The website itself could be blocked by your anti-malware software and that is a big red flag that something is not right with it. It will provide quick access to websites like Facebook, YouTube, Twitter and Wikipedia but we do not suggest clicking on them as it might not be reliable. It will also present you with a search engine that will generate questionable results. Your results will be filled with sponsored content. The less you use it, the better as you could even end up on dangerous websites and run into malware. To avoid putting your computer in danger, we suggest you uninstall Zlappy.com from your computer. In order to take care of Zlappy.com removal fully, we suggest you obtain a reliable anti-spyware program. It will be able to erase Zlappy.com with minimal effort from your. You can also eliminate Zlappy.com manually but it might take more time as you will have to locate it yourself.